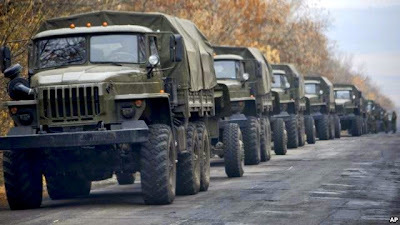 DONETSK, Ukraine -- European monitors in Ukraine said they are very concerned after seeing convoys of heavy weapons and tanks in separatist-controlled areas of Ukraine. 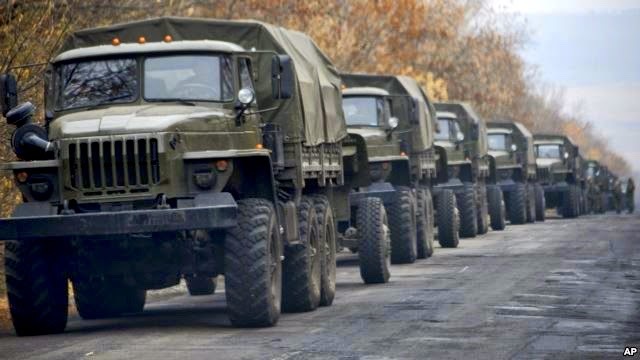 Unmarked military vehicles are parked on a road outside the separatist rebel-held eastern Ukrainian town of Snizhne, 80 kilometers from Donetsk, Nov. 8, 2014. Swiss foreign minister and current chairman of the Organization for Security and Cooperation in Europe, Karl Erjave, said he is worried about a resurgence of violence. Erjave urged all sides Saturday to do all in their power to further consolidate the cease-fire and stay away from acts that could lead to a new escalation. Meanwhile, U.S. Secretary of State John Kerry said in Beijing Saturday the U.S. and Russia agreed to exchange information about developments in Ukraine. When it comes to sanctions against Russia, Kerry said choices Moscow makes on Ukraine will decide what happens. Russian Foreign Minister Sergei Lavrov, who met briefly with Kerry, said it is up to the separatists and Ukrainian government to finalize the cease-fire. Ukraine says Russia has sent dozens of tanks, heavy weapons, ammunition and soldiers into Kremlin-backed eastern Ukraine. NATO sources said that the vehicles appeared to be unmanned. But a spokesperson said they "represent a potential for significant reinforcements of heavy weapons to the Ukrainian separatists." Maybe they should be concerned about the people of Donetsk that are being shelled by the Nazi Guard types every day. I hope the seps wax the guys doing it. BTW, what ceasefire?